French cuisine is typically known for three things, it’s great wine, great bread, and great cheese. If you peruse the cheese section ofCarrefour, you’ll be astonished to find hundreds of cheeses, and I highly doubt the plastic-like “American Cheese” is one of them. In fact, the French even have a governmental board that regulates and assesses whether the cheese produced lives up to it’s name. So, what’s all this hype about this cheese? What type of cheeses are popular in France? In this article, I will present some very popular French cheeses, allowing you to “wow” all your friends with your newly acquired cheese expertise! Because honestly, you haven’t been to France if you haven’t tasted the cheese. Keep in mind that France produces hundreds of cheeses, so don’t feel badly if your favorite didn’t make the list. Hands down the most popular French cheese is Camembert (pronounced Cam-em-behr). I once read a French comment that said, “Americans love their guns like the French love Camembert!“… well, there are a lot of guns here in the U.S, there’s a lot of love for this cheese. Camembert is a delicately soft and creamy cow-milk cheese produced in Normandy, France. Every time I eat Camembert with French people, they always try to warn me that the cheese has a “strong” flavor (the smell is strong too). While some people can’t handle the flavor, I certainly adore it. Camembert came about during the late 1700’s, which means this cheese surely passed the test of time. Even though the cheese is soft, it’s perfectly ripened at the surface… I’m not sure if you like rind, but you have to feast on the exterior of Camembert; you’ll enjoy the two components together. Pair this cheese with a luscious red wine, such as Cabernet Sauvignon or Pinot Noir and enjoy the thought of dining like the French. If you like white wine, consider Chardonnay, Chenin Blanc, orChampagne. Although similar to Camembert, Brie uses pasteurized milk from a different region and is aged longer than Camembert. In addition, Brie de Meaux is made in large wheels (this changes ripening) and the rind to interior ratios are different than Camembert. For all those health conscious people out there, Brie has a higher fat content than Camembert. If you select Brie, you can pair it with any of the wines that are good with Camembert (Champagne, Chardonnay, Pinot Noir). But, opting forSauvignon Blanc or Beaujolais is also a good idea. A sheep-milk based blue cheese, Roquefort provides a mild experience followed by a salty finish. 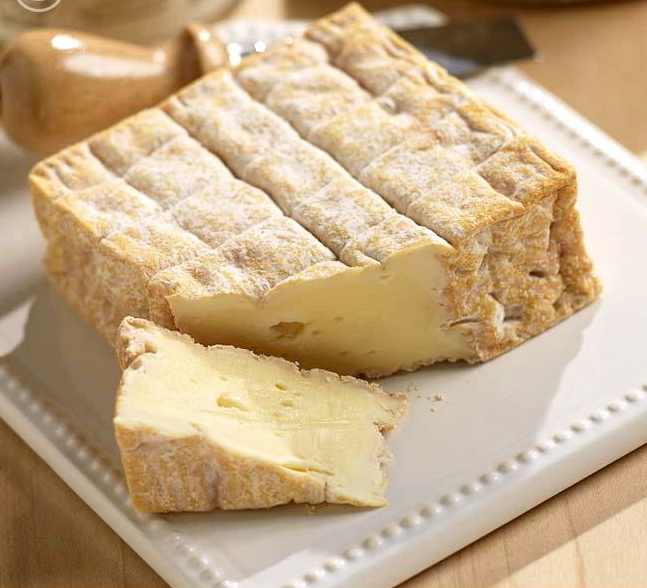 It is characterized by its crumby texture and dark green mold that runs through the cheese. Roquefort does not have a rind, simply a salty exterior. This cheese is ancient, being mentioned in works that came from 79 AD means that Roquefort is one of the best cheeses to ever exist. The French government only allows cheeses created in the special caves near to the French department of Aveyron to hold the name Roquefort, so be wary of “impostors” when shopping. Many people cook this cheese within dishes (pizza, pasta), eat it on crackers, or add it to salads… (think of feta cheese in a salad, except better). Sauternes is the classic wine pair for Roquefort, in addition stick with white wines for goat cheeses. If you had to have a red win then Cabernet Sauvignon would be your go to wine. Named after the specific region in Normandy, France where it’s manufactured, Pont l’Evêque (Pon le-VECK) translates to “The Bishop’s Bridge” in French. This uncooked, soft cow-milk’s cheese traces back to the 12th century, making it one of the oldest Norman cheeses still in production! Some might argue that it smells just as ancient (it’s very pungent), but that barn-like aroma primarily lives on the rind, which turns from yellow-orange to red as it ages. If you remove the rind, you may find it easier to enjoy its creamy taste, full of hazelnut and fruity undertones. The French love this cheese and it’s popularity nears the three cheeses listed above. As is the case with most soft cheeses, Pont l’Evêque is best served at room temperature, perhaps spread on a baguette and paired with cider or Champagne. In the United States, this would be similar to Swiss Cheese. However it is not the soft pliable slices that we put on burgers. Emmental cheese is everywhere, and I can tell you that I ate Emmental the most during my stay in France. This is a medium-hard, cow-milk’s cheese that holds a nice yellow tinge. The famous large holes are formed when carbon dioxide tries to leave the cheese during the last stage of production. Emmental cheese is used in cooking because it makes an excellent gratin overtop of food. The hardness of the cheese also allows it to be grated well (unlike camembert or brie). Pair Emmental with a French Beaujolias or Champagne. Now this is probably one of my favorites. This cheese was produced in Normandy, France by François Boursin during the late 1950’s. This cheese holds a creamy soft texture similar to that of cream cheese, and it’s so delightful! The inventor liked to mix herbs and spices into fresh cheese; eventually he created a spreadable cheese that performs perfectly on bread or crackers. This buttery, cow-milk cheese can be the center of party hors d’oeuvres, meals, or your go to cheese for a nice snack. Substitute Boursin’s “Garlic and fine herb” cheese in place of butter and you can create an unimaginably amazing garlic bread. For some really cool recipes, you should check out Boursin’s website. Besides the spreadable variety, Boursin also offers a normal “crumbly” cheese as well. Buyers should beware that Boursin contains a lot of fat and calories so keep an eye out for the “light” versions on the market. On the topic of wine pairing, with such a soft cheese it would probably be a dessert wine, but you should be creative. Roblochon is a popular French cheese that is produced in caves or cellars near the French Alps. This cheese is traditionally produced from raw cow milk, thus you probably won’t find “real” Reblochon in the United States due to safety concerns. The interior pâte is extremely soft compared to it’s larger rind, I’d like to note that it’s an overall softer cheese than Brie. From a taste perspective, the cheese hits a creamy, nutty note. It is said that Reblochon is very rich due to holding the milk in the cow’s udders longer than usual. This cheese would go well with some Lirac Red, Cabernet Sauvignon, or some Chardonnay.